The leader and defender of his native Wakanda, T'Challa became the Black Panther after his father's demise at the hands of the villainous Klaw. His blend of physical prowess, mental discipline and scientific study makes him a truly formidable opponent in any setting. Black Panther was always a rather low-tier character, until Christopher Priest wrote him in the late '90s under the "Marvel Knights" imprint. This figure depicts Panther as he appeared in that series, with a golden belt and bracelets, and a flowing black cape that has a golden collar acting as a fancy, fancy clasp. The figure is dark grey with all the costume details painted in black, which makes them hard to see - but that's okay, because it's accurate to the comic art. He gets a full-head mask with little ears on the top. It's cute, but why are the eyes so far apart? The face beneath is detailed well, with just the sort of stern, non-jovial look T'Challa is likely to have at any given moment. 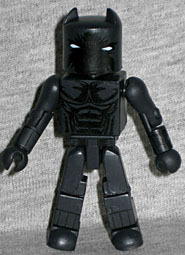 Unlike the first Black Panther Minimate, this one gets hair for when you remove the mask. Diamond has a regular "Ask DST" feature where they answer questions from fans. Whoever is in charge of it has a skill that I never developed: tactfully answering stupid questions without calling the asker stupid. For instance, someone once asked (several months after this figure had come out) why they hadn't made a "classic" Black Panther - ie, one without the cape and all the gold. That was indeed a stupid question, because all the "extra" pieces on this figure are removable, and once you take them off you're left with a plain Black Panther, the way he was seen for decades. This is why you actally have to play with your toys, not just leave them in the box. The leader of the X-Men's Gold Team, Ororo Munroe's weather-altering abilities are powered by an innate control over nearly all forms of energy - limited only by her emotions and fears. This is probably Storm's most famous costume - yes, even beating out the original. It's not that it's particularly good (though it's not at all bad, either), it's just that this is the costume she was wearing when Fox started its X-Men cartoon in the '90s, so it's what she was wearing when a lot of people were introduced to her. There was always a debate about what color her costume was meant to be - black with white highlights or white with black shadows - but AA got it right, going with a pearly white with silver. She gets a new cape with two red X-symbols at the collarbone; for some reason, the golden stripes running over her shoulders are raised elements, and the one on her right shoulder is incomplete. Weird. The hair is new and giant, and has her lightning bolt earrings molded as part of it. Remember the poofy sleeves the Age of Apocalypse figures had? They originated here. She also has two lightning effects that fit over her arms, to simulate her powers. 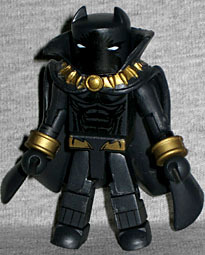 Minimates Series 29 came out in 2009, which was just about the exact halfway point in Ororo and T'challa's marriage, so it's no surprise that the Minimates would be packaged together. Storm is iconic and well-made, but it's Black Panther, with his two different costumes, who steals the show here. This entry was posted in Art Asylum, Marvel, MMMR and tagged Avengers, Black Panther, Minimates, X-Men. Bookmark the permalink. 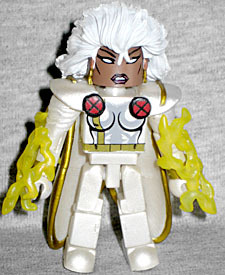 ... wait, there was seriously debate over what color Storm's outfit was? Really? Well, less "debate" and more "fanboys arguing about comics" the way we always do, but yes. It didn't help that this costume was very similar to the one she'd worn right before it, which actually WAS black.